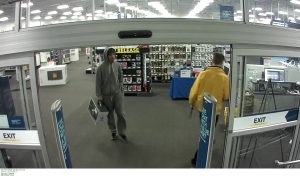 Best Buy located at 2001 W. Worley reported shoplifting after two females entered entered the store, retrieved multiple thermostats and placed them in a basket before fleeing the store without paying for the items. About a week later, one of females returned accompanied by a male. 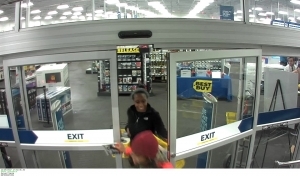 The female retrieved the remaining thermostats and the male retrieved a drone before leaving the store without paying for the merchandise. Video surveillance turned over to CPD shows these three individuals as possible suspects. If you have any information regarding their identities or whereabouts, contact CrimeStoppers.